The sura opens with the Bismillah and five Arabic letters: Kaf Ha Ya 'Ayn Sad. The remaining 97 ayat can be divided into three primary sections. The first section, verses 2–40, consists of the narrative of the prophet Zachariah and the birth of his son John, the story of Mary and the birth of her son Jesus, and a commentary on Jesus' true identity which rejects the Christian claim that he is God's son. The second section, verses 41–65, tells of Abraham's departure from his family's idolatrous ways and then refers to many other prophets. The text discusses the various responses of those who heard their prophecy and the fates those hearers met; throughout these descriptions, the oneness of God is emphasized. The third section, verses 66–98, confirms the reality of resurrection and offers depictions of the Day of Judgment alongside depictions of this life. In its original Arabic, the text of sura 19 progresses through a series of varying rhyme structures that correspond to the content being discussed. Throughout the initial narration of the stories of Zachariah and John, Mary and Jesus, and other prophets, verses rhyme based on the syllable 'ya'. When the text moves on to a commentary on the true identity of Jesus, words rhyme due to a long 'ee' or 'oo' preceding a nasal 'm' or 'n', which is considered to give an air of settledness or finality to the subjects being discussed. The first rhyme scheme is then resumed during further accounts of earlier prophets and changes to a rhyme based on a medium 'a' following a voiced 'd' when the Sura discusses punishments for those who reject truth and the prophets. The strength of this vocalization is exchanged for the stronger still double 'd' sound when denouncing unbelievers for their criticism. Maryam in Syriac (ܡܪܝܡ) is a common adjective connoting blessing and perhaps the verb "[God] exalts her". 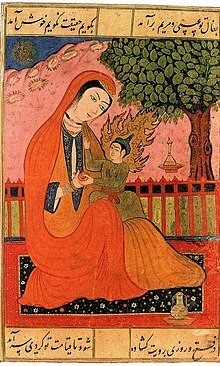 Mary, the figure from whom this Sura takes its name, is the only female referred to by name in the entire Qur'an. She is attributed the honorific title 'Sister of Aaron' in verse 28, and Jesus is referred to by his familial connection to her in verse 34; in a text and culture in which individuals were identified by their descent from male family members, the identifying title 'son of Mary' places startling emphasis on Mary's motherhood. This emphasis draws attention to the unique circumstances of Jesus's birth; it was not a biological process, and no father was involved, but it rejects the Christian belief that he was begotten by God. The text describes the agony of Mary's childbirth in great detail, including her wish that she had died long ago in order to avoid such pain. Despite this great hardship, God is portrayed as compassionate and attentive to Mary's needs; He urges her not to worry and provides her with food. Feminist reading of the text points to this treatment of childbirth as verification of the process's special significance. Other scholars point to the interaction between Mary and the angel Gabriel as indicative of traditional gender roles at the time; when Mary, a solitary female, encounters the male angel, her first reaction is fear of the impropriety of the situation and uncertainty regarding the angel's intentions. She can hear the angel's message and question him only after he assures her that he has come as a messenger from God. The text of the sura alludes to many known prophetic figures, including Isaac, Jacob, Moses, Aaron, Ishmael, Idris, Adam, and Noah. According to Sayyid Qutb's commentary, these references serve to emphasize God's oneness and to delineate the various possible responses to prophecy and their consequences. ^ Haleem, M. A. S. Abdel. The Qur'an: Sura 19:1. New York: Oxford University Press. ^ Haleem, M. A. S. Abdel. The Qur'an: Sura 19:2–40. New York: Oxford University Press. ^ Haleem, M. A. S. Abdel. The Qur'an: Sura 19:41–65. New York: Oxford University Press. ^ Haleem, M. A. S. Abdel. The Qur'an: Sura 19:66–98. New York: Oxford University Press. ^ Wadud, Amina. Qur'an and Woman: Rereading the Sacred Text from a Woman's Perspective. New York: Oxford University Press. ^ Sells, Michael. Approaching the Qur'an: The Early Revelations. Ashland, Oregon: White Cloud Press.